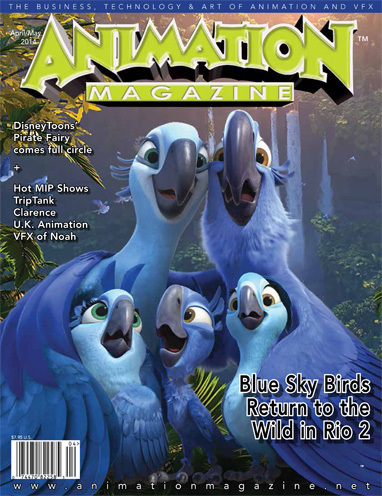 Return to Rio - Director Carlos Saldanha and Blue Sky Studio fly Blu, Jewel and friends into the unknown territory of the Amazon in Rio 2. Connecting to a Classic - DisneyToons' The Pirate Fairy steers the Tinker Bell franchise into familiar territory that closes the gap with its origins in 1953's Peter Pan. CN's New Bundle of Joy - Creator Skyler Page and creative director Nelson Boles spread good vibes with their original series Clarence for Cartoon Network. Turn it Up to Eleven - A list of 10 plus 1 shows to watch out for on the floor at MIPTV during the annual market. A Big Relief - New tax credits are giving an immediate jolt to the U.K. animation industry. Rio 2, The Pirate Fairy, Clarence, TripTank, Robot Chicken, MIPTV, U.K. animation and much more!